Sony Tablet S review | What Hi-Fi? Sony remains a brand with huge appeal and popularity, with househould names such as Walkman and Bravia still going strong thanks to consistent reinvention. It no doubt hopes we’ll one day refer to its Tablet range with similar reverence. 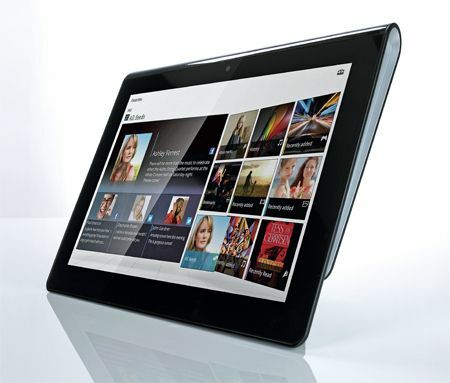 The Tablet S is the first to break cover; it is set to be joined by a clamshell-design Tablet P before Christmas. 18 months since Apple unleashed the iPad, there remains space for a convincing alternative. The Tablet S sets itself apart from the crowd thanks to the tapered chassis. Held in landscape form, the tablet widens to just over 1cm at its thickest point in an effort to be both more easy to hold and to view when placed on a flat surface. It works. It’s comfortable to hold, helped by a grippy finish to the rear. It’s light, too. But that light feel is a double-edged sword: it doesn’t have the premium feel of its Apple rival. The 9.4in screen makes it slightly smaller than the pack, but the 1GB RAM, 1Ghz processor and 1280 x 800 resolution LCD screen are par for the Android course. There are two cameras – one will shoot HD 1080p video – Bluetooth and DLNA support and a battery life of around eight hours. This is the 16GB device but an SD card slot will allow you to expand it. With Android 3.2 at its heart, the home screen and OS is familiar but largely effective. More exciting is the individual spin that each manufacturer can put on their tablet. In Sony’s case, it’s exactly what’s been missing on other Android tablets: content. With Music Unlimited, Video Unlimited and the PlayStation Store, Sony has the potential to deliver a compelling media package. These are three separate services, each with its own icon, but you can access all three using the one PlayStation or Qriocity account. It’s very early days – we tested the services during their first week in Tablet format – but logging-in, depositing cash and buying content seems buggy, while synchronisation between all three is far from reliable. Being forced on to a computer to complete the initial set-up seems strange, too. Much of this may be ironed out given time, and while we haven’t had similar issues with other Android tablets, that’s because they don’t offer any content at all. So what are you left with? Video Unlimited promises SD and HD films to rent or buy, with prices from £2.99 to £4.99. We couldn’t find much HD content, but did download an SD version of Green Lantern. It took a while, not helped by the Tablet S’s propensity to drop its wireless connection. The screen is something of a fingerprint-magnet but there’s decent detail, dynamic colours and true black levels. It’s a little gloomy but for a standard-definition film it’s perfectly watchable. Music Unlimited meanwhile is a cloud-based on-demand music service. Pay a monthly subscription of £9.99 – there’s a much more limited ‘basic’ service for £3.99 – to access a library of some 10 million tracks. You can instantly stream tracks, add them to your library and create playlists. A neat feature is Sony’s Music Sync (similar to the soon to arrive iTunes Match), which will give you ‘cloud access’ to your tracks. And it works well: it finds our tracks, some quite obscure, and they appear, with artwork, in our library for streaming when connected to a network. This works with AAC, MP3, WAV and WMA files – even finding tagging info and artwork for WAVs. Sonically it’s competent. Not as open or dynamic as the best, but there’s decent detail and a nicely balanced sound. The PS Store for games is clearly in its infant stage, with just 10 titles available, each costing £3.99. Again this has potential but content is underwhelming for now. And you can, of course, fill your Tablet S with your own audio and video content. A wide range of file formats is supported, including AAC, MP3, FLAC and WAV, plus H.264, MPEG-4 and WMV. Sony has successfully set itself apart in the already busy Android tablet market. By combining the openness of the Android OS with a huge library of music, video and games, Sony could have a winner on its hands. But it’s not quite there yet. The Tablet S needs to be slicker, simpler and more reliable, not to mention better performing to topple the Apple king. But it’s a promising start from Sony’s first tablet.